Close to an hour later, still sitting on that warm bench outside the Louisanna airport, Greg and Julia pull up. I hadn’t seen Greg in months and he looked tanned and happy, despite the two flat tires. Julia introduced herself and suggested we get something to eat. We ended up at a wing restaurant (one of Greg’s favorites) and enjoyed a good meal and a beer. It gave me time to ask some questions and get a feel for what I was in for. It didn’t take long for me to realize that Julia was a happy go lucky ball of fire! She was relieved to have another female come aboard as she had been the only female among a seven man crew. She was desperate for female conversation. I too was happy there would be another female aboard, but what would I have in common with a 24 year old that had never been married or had children ( I had both by that age). Since we were to be roommates, I would make the best of it and hopefully it would all work out. It was a 45 minute drive back to the ship. Julia was excited and talking nonstop. I was tired and just wanted to go to sleep. But there was the crew to meet and I really wanted to make a good impression. So with another deep breath and a big smile I plugged along answering questions and asking a few of my own. As we pulled into the yard, which was on a fairly long desolate stretch of road, I noticed the grounds were not well kept. The grass and weeds had taken over. There were a couple of small out buildings, some huge cranes and a large metal building that I later learned was the owner, Roy’s work shop. Roy employed a few guys that the crew had become friendly with. As we pulled up next to the ship my mouth dropped. Though I had been told the Sea Hunter was 220′ long, I had no idea what to expect. My first impression was utter disbelief. Having been recently painted (blue, white and gray) she looked impressive. It was hard for me to believe I would be living and working aboard this beautiful ship. 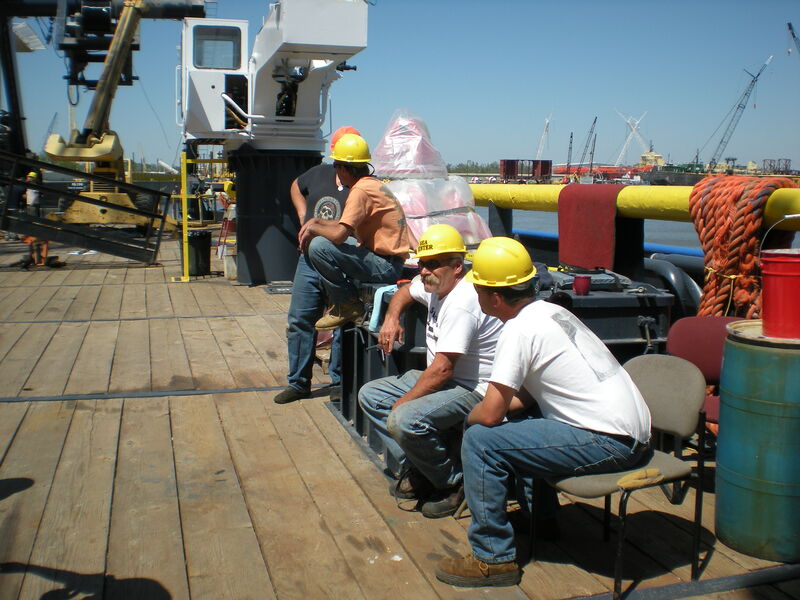 As we stepped aboard the ship I noticed a few of the guys were sitting around the deck talking and having a smoke. I was introduced to Gary, Shawn, Alex, Matt and Dave. All were deck hands and had been working to restore the ship for the past few months. They were friendly and welcomed me aboard. After some small talk we went inside to take a tour. From the deck you walk directly into the galley. I was prepared for it to be small and cramped, but to my surprise it was open and bigger than my kitchen back home. There was a large pantry that housed all the dry goods, a big walk in cooler with an adjoining deep freezer. The galley had a nice cooking stove/oven with a microwave above it. A regular size refrigerator and tons of cupboard space. Now this was a kitchen ( or should I say galley) that I could work in. The sink and counter area separated the long bench style table. On the far wall was a huge flat screen tv. There were three sleeping quarters off the galley. One was a room that had three bunk beds with six small lockers for each bed. Another room had two beds and lockers and the third one was a single room that Brian, the Chief Engineer lived in. It was crowded with tools and equipment almost covering the entire floor. I later came to realize that this was the norm. He was always working on some piece of equipment. The last room housed a washer and dryer, two shower stalls and two heads. I was impressed. We headed upstairs to more living quarters. Greg’s room was fairly spacious compared to the others. He had a good size bed, bureau, desk and tv. He also had his own head and shower. Across the hall was a room with a bunk bed, closet and built in desk. Down the hallway were two more rooms (across from one another) that also had a bunk bed, closet and desk. The room that I was to share with Julia was small but functional. She offered me the top bunk which made me happy as there was a window that would allow me a view. Outside the two rooms was the lounge area. On one side of the room were two futons, a recliner and another good size tv. Along the wall was a bookcase which held lots of movies and books. On the opposite side of the room was a round table with four chairs fixed to the floor. Against that wall was a computer for the crews use. The area was clean, functional and overall comfortable. I started to relax and felt maybe this wouldn’t be so bad. We then proceeded up another flight of stairs to the bridge. It was a nice size room covered with windows. On one side was a large desk with another huge tv/monitor. The desk was covered with nautical charts and protected by plexiglass. Greg clicked on the monitor and the tv lit up with nautical charts. He explained the what the different programs were capable of doing. Though I didn’t understand what any of the symbols meant it was still quite impressive. A leather captains chair was in front of the ship’s wheel with seats on either side. I hopped up into it and was amazed at how many instruments the dash area had. Along the other side of the room was a fixed black leather bench that looked quite comfortable. The back of the room overlooked the deck below. There were two more chairs that faced the back and controls that allowed you to steer the ship from there. I had no prior experience aboard a ship and was not familiar with any of the instruments and buttons. As Greg was pointing out what different ones were used for, I felt such a swell of pride for him. Thinking back when he first started and all the challenges he had went through and here he was know, the Admiral of this beautiful grand ship, the M/V Sea Hunter. We talked a bit longer before I excused myself to go to bed. As I stretched out on my top bunk barely able to keep my eyes open, I was thinking of what had transpired over the last 24 hours. I had left Maine in a cold rainy storm and now here I was, in steamy Louisiana, on a ship with mostly strangers and not a clue of what was ahead of me. Normally I might of had a bit of anxiety, but for once, I really didn’t care. I was ready for a new adventure and looking forward to what tomorrow was going to bring.